Thank you for purchasing CORONA’s S-FHSS/FHSS compatible receiver. This production can supply enhancement smooth flight with FUTABA S-FHSS/FHSS link. 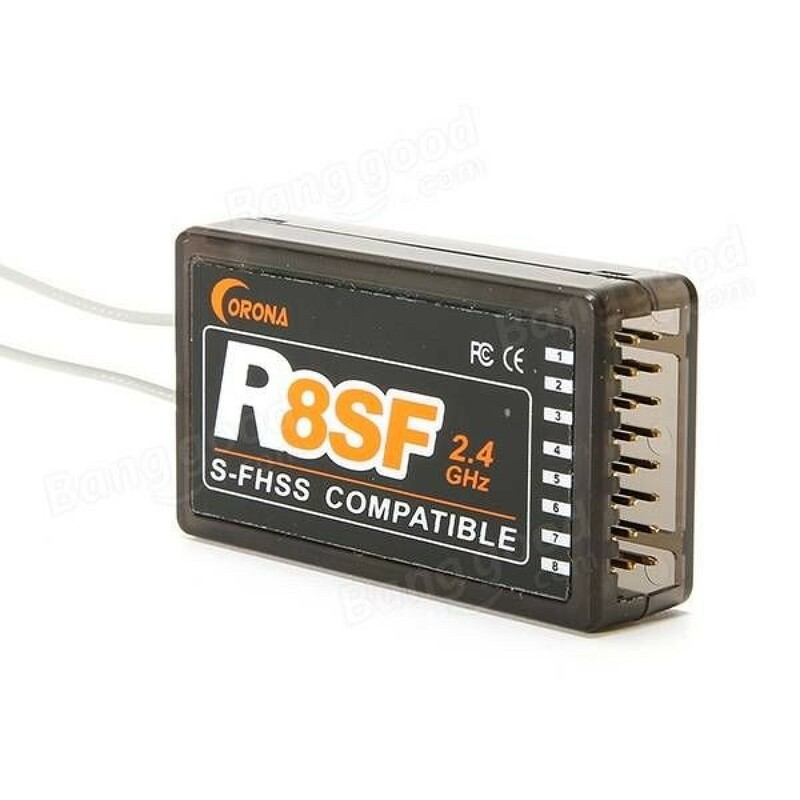 CORONA 2.4GHz S-FHSS/FHSS Compatible Receiver is designed to use with FUTABA S-FHSS/FHSS 2.4GHz transmitters, such as air system T4YF,T6J,T6K,T8J,T10J, T14SG ,T18MZ,T18SZ or surface system 3PL,T3PRKA,4PLS,T4PX,T4GRS under S-FHSS/FHSS protocol mode. 8ch ,6ch and 4ch servo channels in R8SF, R6SF and R4SF under normal status. S.BUS output support expanding servo channels on the 8th channel of R8SF, the 6th channel of R6SF and the 4th channel of R4SF under special status. 20.4mS latency under normal status after bind support analog servos,13.6mS latency under special status supply enhancement smooth flight with digital servos. Turn on the S-FHSS/FHSS transmitter, leave it 0.5M~1M away the receiver. Connect the battery to the receiver while pressing receiver’s F/S button. Red LED light on and Green LED off when searching signals, and turn to Green LED light on and Red LED off indicate bind is succeeded. R8SF, R6SF or R4SF set failsafe on the S-FHSS/FHSS transmitter just like the operation of the FUTABA receivers if the feature exist. We highly recommend you set failsafe feature while flying your models. An example of a useful Failsafe setting would be to shut down the model’s throttle, so that it does not fly or drive away uncontrolled. If your receiver has been linked with your transmitter, please power off your transmitter. When your receiver’s LED light red, push down and hold the button on your receiver for more than 6 seconds and not more than 10 seconds, release the button to see the green led flash, push down the button again right now, receiver get back to light red. Now the MODE status has changed between Special mode and Normal mode. When green led flash low indicate normal mode to special mode, and green led flash fast indicate special mode to normal mode. Under the special mode status, you can get S.BUS output feature on the last servo channel, other channels not changed. NOTE: if you want to reset the receiver to normal mode, you can rebind the receiver to your transmitter. If you want to take analog servos on the model, please take normal mode. If you want to get more smooth flight feeling, please take digital servos and switch receiver to special mode.